Filleting your catch is very important and it needs to be done properly. The tools right tools must be used and cutting skills are needed. A fish fillet can be easily filleted when the right tools are available. 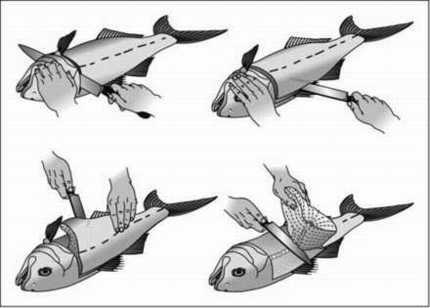 The pictures and tips below will guide any angler when having to fillet his catch. The tools needed are shown below. 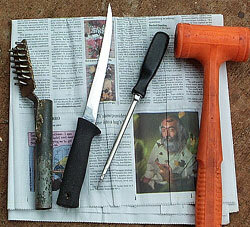 Fish scaler, sharp knifes & filleting hammer. 1. Make sure your knives are very sharp or you will rip and tear the flesh. 2. Go slowly at first. It takes practice to become an expert at filleting a fish. 3. Removing the fillet from the rib cage is the most difficult step. Be very careful and go slowly. 3. Then pull out the knife and cut the underside of the fish. 4. Now peel the first fillet off and cut any connecting flesh off. 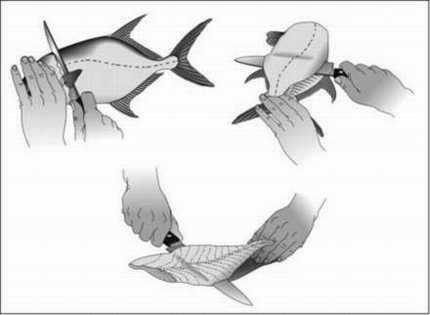 If you use this simple method of filleting your fish you will have a lovely fish steak for the braai.